Our Park is full of loblolly pines. Houston is full of loblolly pines. The southeast is full of loblolly pines. The loblolly is one of the most common tree in the US, second only to the red maple. As common as loblolly pines are, you might overlook a similar but very different pine that’s unobtrusively getting started near the Greentree area. It is a longleaf pine, and it doesn’t belong here, but I’m sure glad it is. Our longleaf pine is about six feet tall. 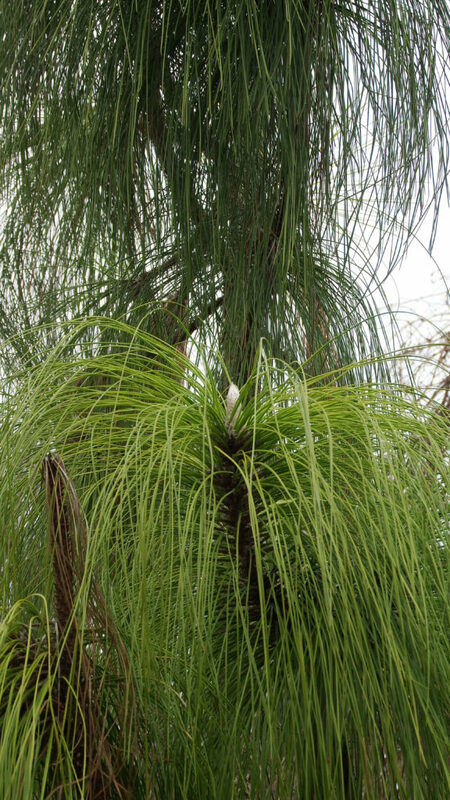 It has feathery clumps of long needles. Someone referred to this as the “Cousin Itt phase” referring to the 1960’s Addams Family show. Google him if you don’t recognize the similarity! Unlike our fast-growing loblollies, longleaf pines take 100-150 years to reach their full size and can live to be 500 years old. They were once common in the southeastern tier of the US, but between their value as timber and felling for competing land uses, the tree is now endangered which is catastrophic for a huge number of species that depend on this tree for survival. Our lone specimen is of no consequence to the endangered situation. What matters for that are longleaf pine forests. Longleaf pines are the cornerstone of an entire ecosystem based around it. We are lucky that W.G. Jones State Forest (up near Conroe) is one of the most important remaining longleaf pine forests. It is home to the red cockaded woodpecker, a species that is itself endangered due to the loss of the only tree in which it nests. Our little guy is really more of a curiosity and a chance to see a longleaf pine without driving too far. 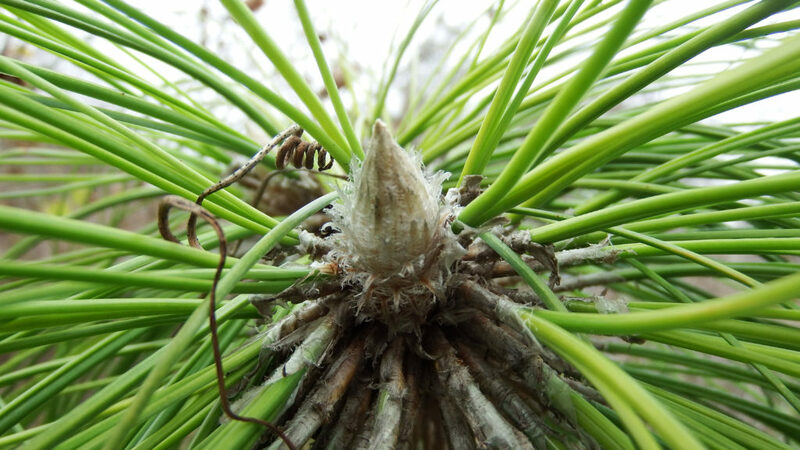 One of the distinguishing features of the longleaf pine (other than the incredibly long leaves), is this silvery growth tip. The longleaf pine is, unsurprisingly named for its very long needles. The one in our Park clocked in at a massive 18 inches. This photo shows the needles of a loblolly for comparison. I am pretty certain this tree didn’t grow here of its own accord. 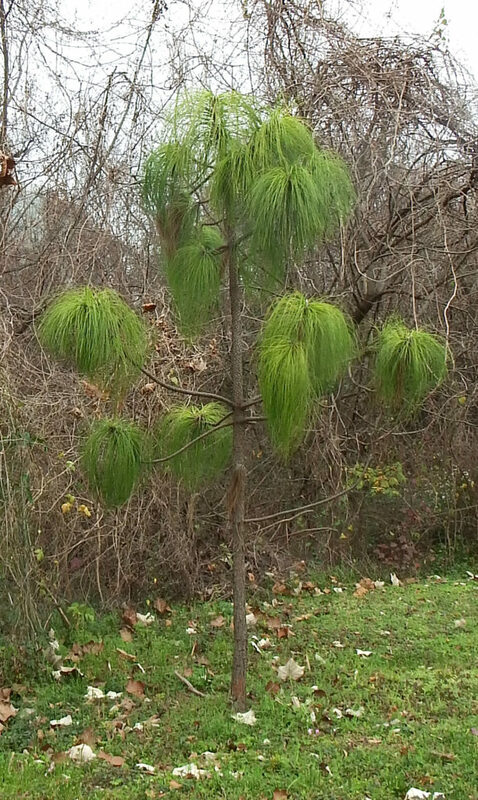 For the first five to 10 years of its life, a longleaf pine looks like a clump of stiff grass. During this period, the tree is putting down a massive tap root. Once the root structure is in place, the tree starts to put on height. So if this tree started here from a seedling, it has to have been going for at least 15 years. 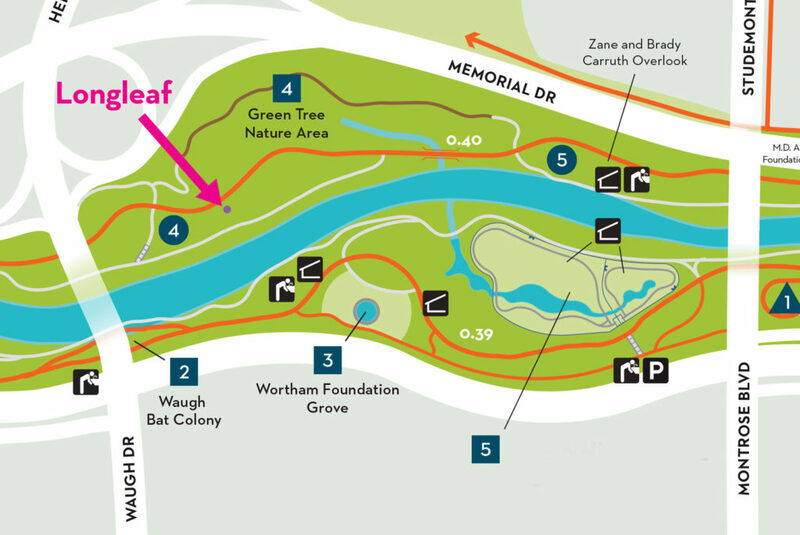 It’s likely this tree was mistakenly sold as a loblolly and planted by the park as part of its normal tree replacement. It is, as far as I know, the only longleaf in the park probably one of the few in Houston. If you get a chance to see the tree for yourself, walk through the grass to get a close look. The bark is fascinating. Below is a portion of the lower bark. 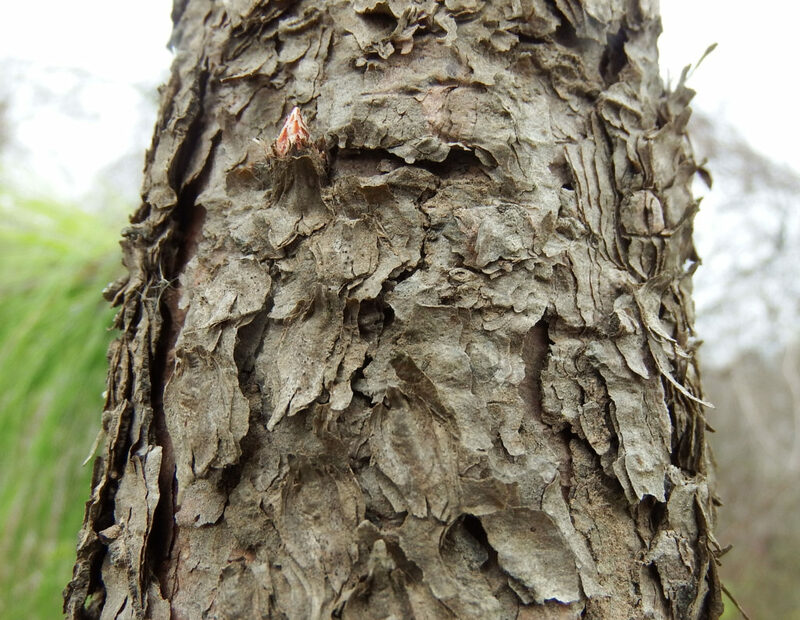 The upper bark, which is less developed looks entirely different. You can see what I imagine to be a budding branch at the upper left of the trunk. Longleaf pines would not be naturally present in our Park. Houston is part of a coastal prairie ecosystem and our Park is part of a multi-state effort to restore this amazing landscape. Coastal prairies were virtually treeless. We would have had trees along the bayous, but those would have been trees that enjoyed (or at least tolerated) wet feet. Loblollies fit the bill perfectly. So do black willow, cypress, and sycamores. The longleaf, not so much. Longleaf pines are not solitary specimen trees. They are usually found in forests of longleaf pines. So our little guy is sort of orphaned here, and a bit out of place, but it is a tremendous chance to spend quality time with a fairly rare tree.